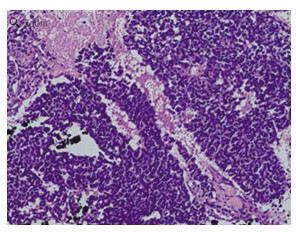 Abstract: The author reports a case of small cell carcinoma of the cervix. The patient had a 7-day history of headache and a hard mass in the parietal region of the cranium on the right side as the first manifestation. Cranial CT scan showed a high-density nodule on the right parietal lobe, with a surrounding low-density edema and adjacent skull bone destruction; thus, intracranial tumor was considered. MRI brain scan showed a slightly longer T1 and T2 signal nodule, with edema in the right parietal lobe. The lesion was significantly enhanced after the application of contrast. The 18F-FDG PET/CT whole-body imaging showed a solid mass of cervix and slightly large bilateral pelvic lymph nodes and presented multiple bone destruction with high FDG uptake. The histopathological examination revealed small cell carcinoma of the cervix. Small cell carcinoma of the cervix has extremely low incidence, its clinical manifestation lacks specificity, and it is not easily detected at its early stage. Small cell carcinoma of the cervix is an aggressive tumor and commonly have early metastasis through lymph node and blood circulation, with a poor prognosis. 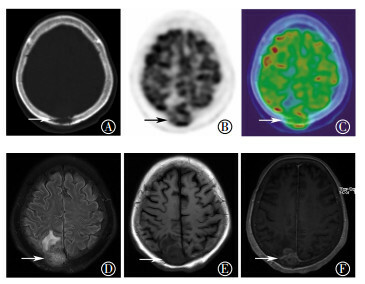 The sensitivity of 18F-FDG PET/CT in detecting primary lesions and metastases, including lymph node, bone, and other occult lesions, is high. Thus, this method is valuable in the clinical management of the small cell carcinoma of the cervix.